Showing 31 articles from January 25, 2017. Louisburg College has received gifts worth more than $1 million this year. Allen de Hart, 90, who died Oct. 14, 2016, and Mattie Pickett Edwards, 98, who died Dec. 22, 2016, each had made the college a part of their estate plans. "As we celebrate 230 years, we recognize that the College has been sustained by the faithful legacy giving of people like Allen de Hart and Mattie and John Edwards," said Dr. Mark La Branche, Louisburg College's president. 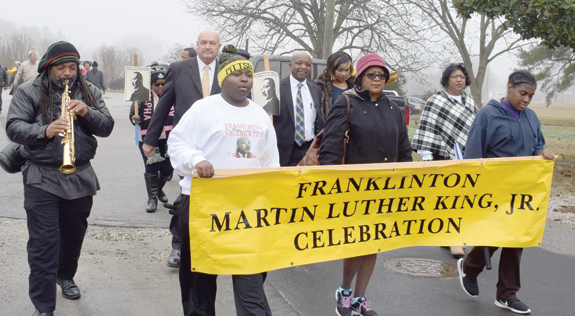 This is the Franklin County delegation that attended the March in Washington, D.C.
WASHINGTON -- A contingent of Franklin County residents joined more than a million people who marched on Washington and the world, making a stand for women's rights and human rights. During the historic event, a local organizer of the event, Jenny Edwards, said she was most struck, though, by a man who couldn't literally stand up -- but rose proudly for the cause. DIRECTOR HONORED. 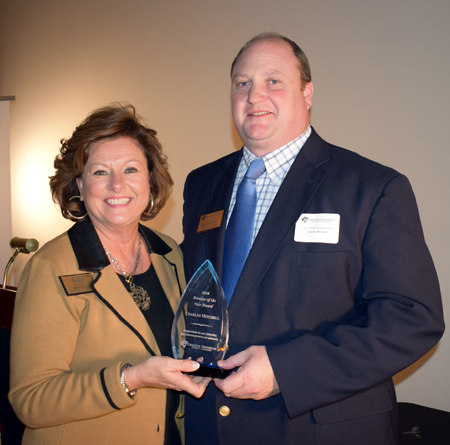 Chamber director Charles Mitchell receives an award from Chamber Chair Bobbie Jo May. Mitchell was named Director of the Year. YOUNGSVILLE -- About 20 years ago, Franklin County businessman Keith Smith got a good idea of what history and culture meant to Betsy Benning when she told him he'd have to take his idea for an automotive shop down the road, away from the Wolfpit -- an 1840s antebellum home she had moved into some five years before. Smith wanted to open his shop next to the former plantation's historic home, but as Smith recalled, Benning said "it ain't gonna happen." 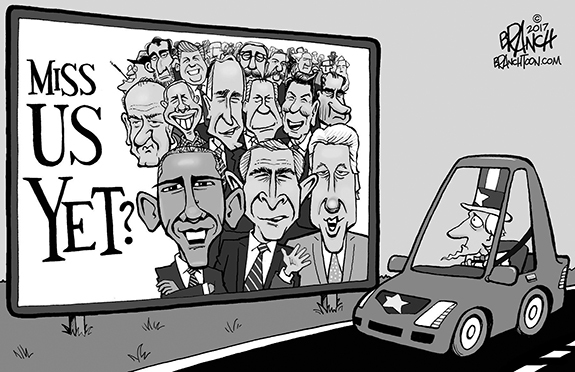 Editorial Cartoon: Miss Us Yet? Imagine a bunch of folks standing in a circle with each person pointing to the person on their left as the reason for the problem. That's as accurate a description with North Carolina's school capital expense funding "system" as I can write but it could get even worse -- and the kids get even more short-changed. As it is now, the school board asks the county commissioners for funding while the state sits comfortably above that fray. 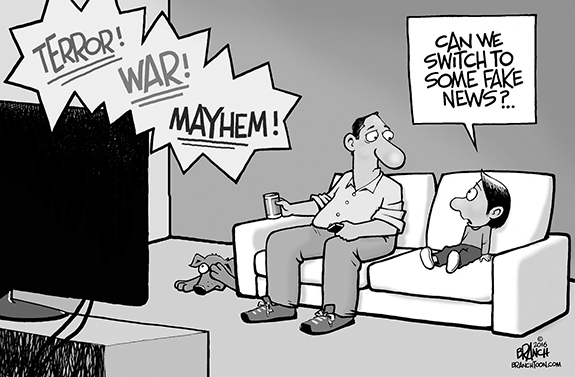 Fellow Americans, we have entered a brave new world and we must adapt! 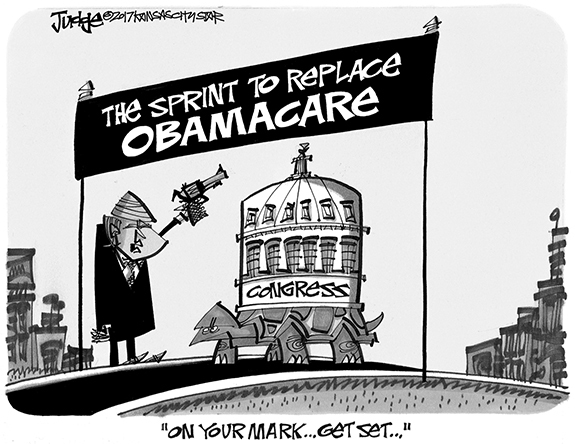 It may not be easy -- and just understanding is going to be difficult for many Americans of "that certain age." Not too long ago, the new mantra was that "facts don't matter." To go a step further, the word was that we have entered a "post factual age," whatever that might mean. Really, does one and one not add up to two anymore? For just as many millions of people who took part in Women's Marches across the country, and the world for that matter, there are just as many questions about what it was about, what it meant and what happens next? But first, let's talk about what took place. Dear editor: The first few days of the Trump Administration have been interesting, to say the least. His inaugural address was pure Trump. Unlike his predecessors, he did not call for unity. Instead, he excoriated all recent administrations, Democrat or Republican. Several newspapers reported his inauguration as a hostile takeover of Washington. OAKES, N.D. - Ivan Mann, 65, of Oakes, N.D., died Monday, Jan. 23, 2017 at Prince of Peace Care Center in Ellendale, N.D.
BRODIE TO THE BUCKET. Franklinton's Jerrail Brodie drives for two points during last Saturday night's road boys basketball victory at Southern Vance. HENDERSON -- There's something about the recent portion of the Franklinton-Southern Vance boys basketball rivalry that brings out a nail-biting finish. 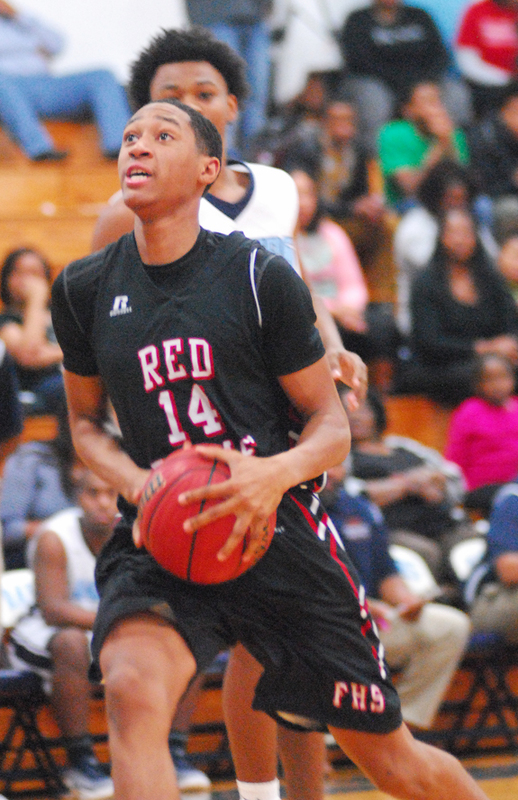 During last year's Northern Carolina Conference Tournament championship game, the Runnin' Raiders made the plays in the final two minutes to edge Franklinton for the league title. 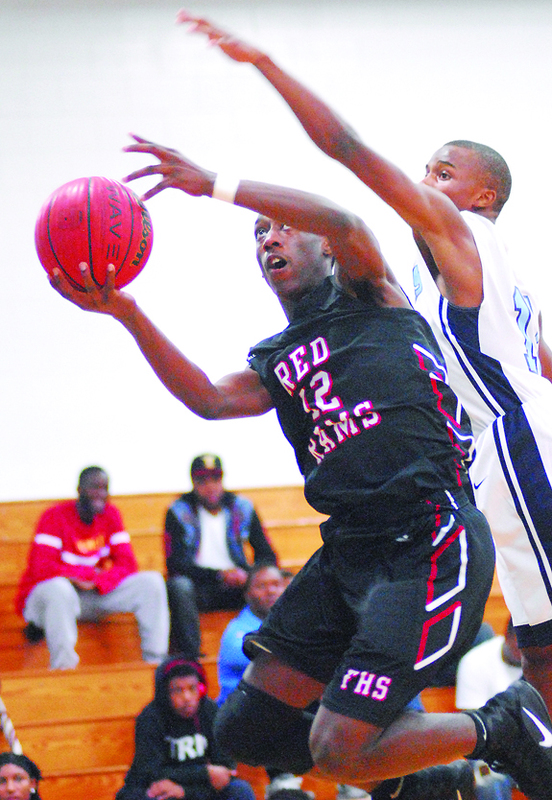 But the surging Red Rams returned the favor last Saturday in Henderson during the clubs' first meeting since the conference tourney. ROCKY MOUNT -- Given their long-time baseball rivalry, Pitt Community College and Louisburg College don't usually share a social spotlight -- but that was the case Monday during a signing ceremony at Faith Christian School. Ben Lewis and Braxton Varnell, members of Faith Christian's 3-4 batting lineup punch, finalized their next-level intentions by signing letters-of-intent. Varnell, a hard-hitting catcher, accepted a scholarship to Pitt, while Lewis, a slick-fielding shortstop, signed with Louisburg in front of LC head coach Blake Herring, who made the drive from Franklin County. 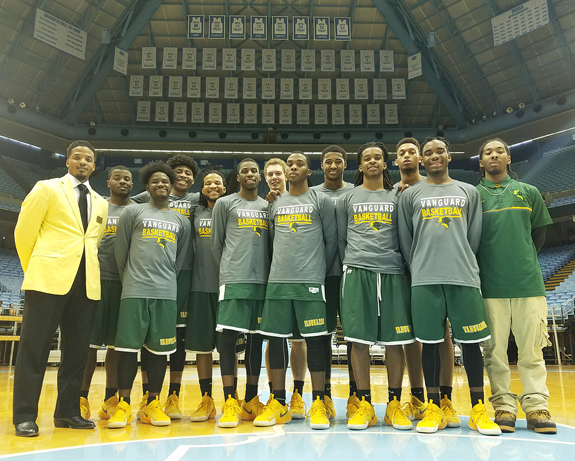 KINSTON -- Most championship level basketball teams possess two key intangibles that make them successful -- the ability to win while playing at an opponent's preferred pace and the ability to win on the road. 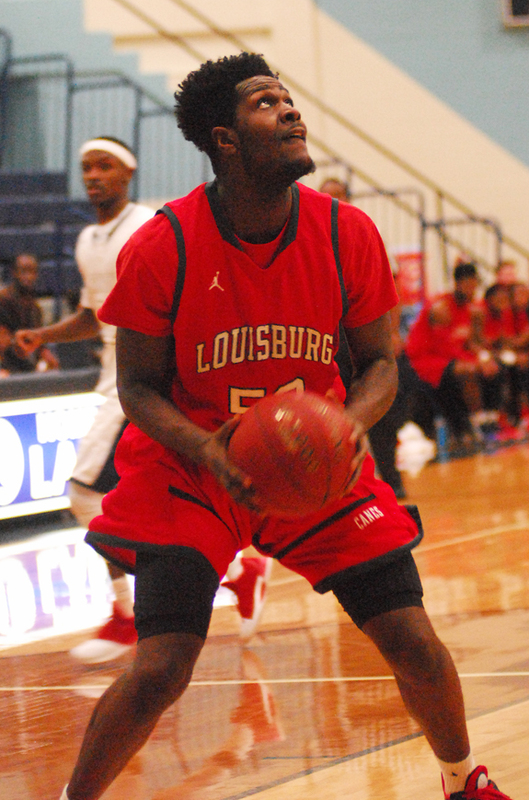 Louisburg College has displayed both of those traits in recent weeks as the Hurricanes have been challenged in Region X away from home, but have continued to pile up the victories. HENDERSON -- Trailing by 16 points at halftime, the Franklinton Lady Rams certainly didn't appear to be on the verge of pulling off an upset at Southern Vance last Saturday in Region X girls basketball action. But thanks to one of their strongest halves of the season, Franklinton almost made it all the way back before dropping a tough 42-37 decision against the homestanding Lady Runnin' Raiders. SAFETY FIRST. 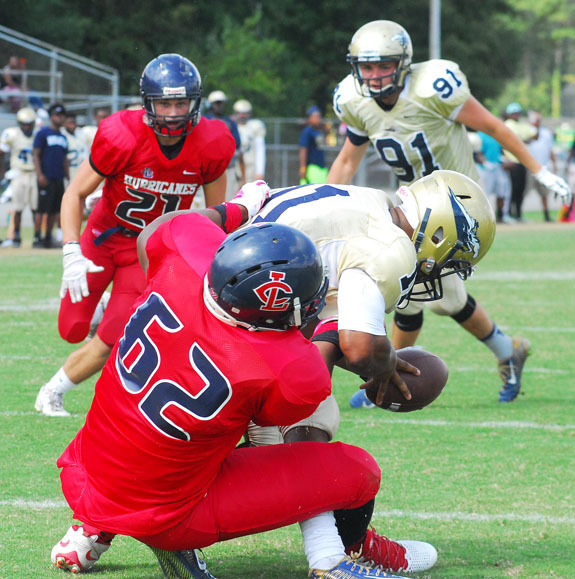 Louisburg College's Larrell Murchison (62) registered this quarterback sack and safety during the Hurricanes' 2015 road victory against the North Carolina Wesleyan JVs. LOUISBURG -- It's a long way from tiny Clarkton to a Southeastern Conference school -- especially when a two-year detour to Louisburg College is involved. That's the route Larrell Murchison has taken in his football career, and the LC sophomore defensive lineman is about to reap the benefits of his endeavors. Murchison, who has starred on the field and in the classroom for the past two seasons at LC, is being courted by several SEC schools ahead of the National Signing Day in early February. BUNN -- For Bunn, it was one of the biggest victories of the season. 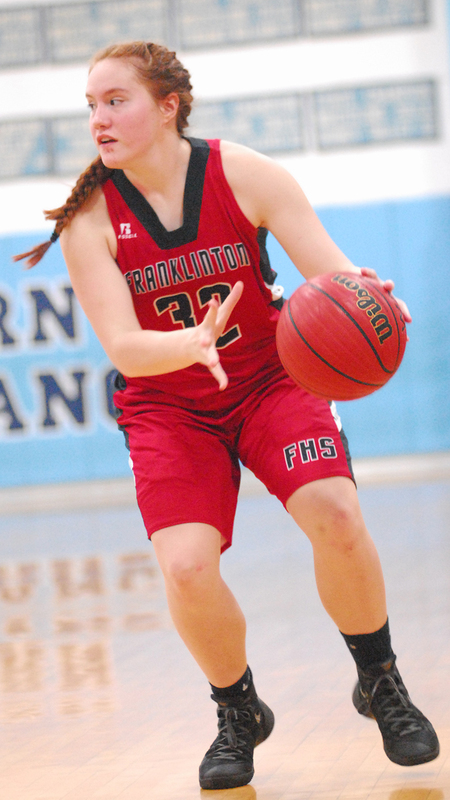 And for Franklinton, it was a lost opportunity to sweep it girls basketball schedule against Franklin County opponents -- and remain in the potential mix for a Class 2-A State Playoff spot. 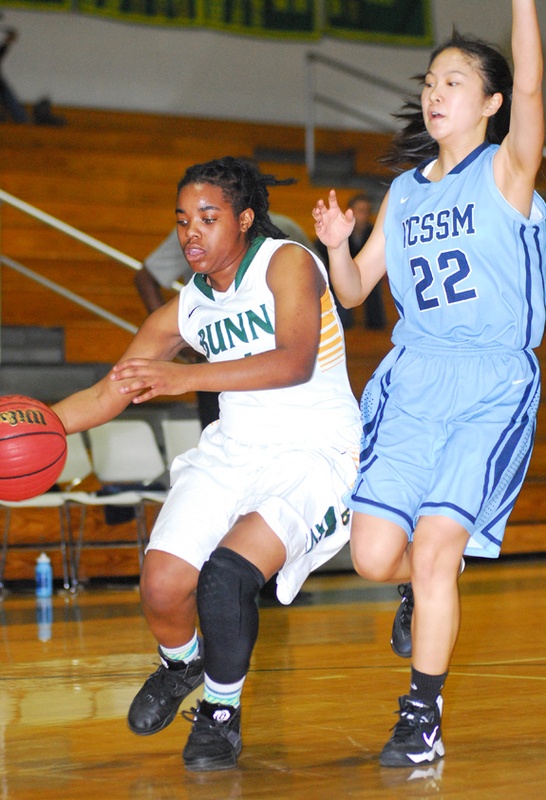 Trailing by seven points in the fourth period, Bunn was able to rally and defeat the Lady Rams by a 34-28 margin in Northern Carolina Conference girls hoops action Tuesday at the Bunn Dome. 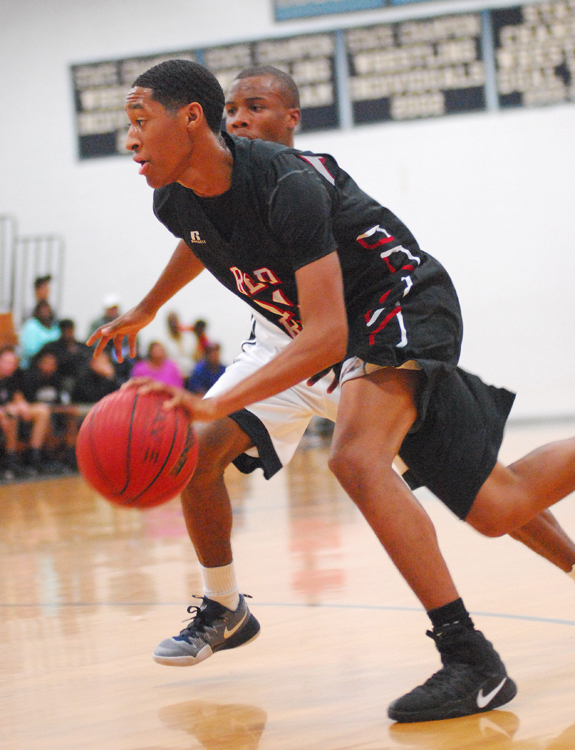 HENDERSON -- The host Kerr-Vance Academy varsity boys basketball team picked up a key conference victory versus Faith Christian at Crawford Gymtorium last Tuesday evening. The Spartans shot extremely well in the first half jumping to an early 29-19 lead after the first quarter, with Franklin County resident Michael Bowers picking up 19 points in the first on the way to a season-high 44 for the night. CHAPEL HILL -- The Vance-Granville Community College Vanguards men's basketball team achieved one of the most stunning upsets in program history on Jan. 18, defeating the University of North Carolina junior varsity team by a score of 106-100 at the Dean E. Smith Center in Chapel Hill. This was VGCC's second trip to Chapel Hill and the team's first win over the JV Tar Heels, who were undefeated this season before the contest. Henderson-based radio station WIZS 1450 AM provided live coverage of the game, just as in the first meeting of the two programs in 2016. ZEBULON -- The Carolina Mudcats are offering a special Valentine's Day promotion as Muddy the Mudcat is available to make an appearance to visit your loved one. During his visit, Muddy will present the special person with a bouquet of roses, a box of chocolates, balloons and two premium-level tickets to a 2017 home game at Five County Stadium in Zebulon (excluding July 3-4). For more info or to arrange a visit from Muddy, call the Mudcats at (919) 269-2287. Franklinton High School's Delton Davis (with ball) uses his body to protect the basketball during last Saturday night's road conference conquest against Southern Vance. Jerrail Brodie scores for Franklinton High School. 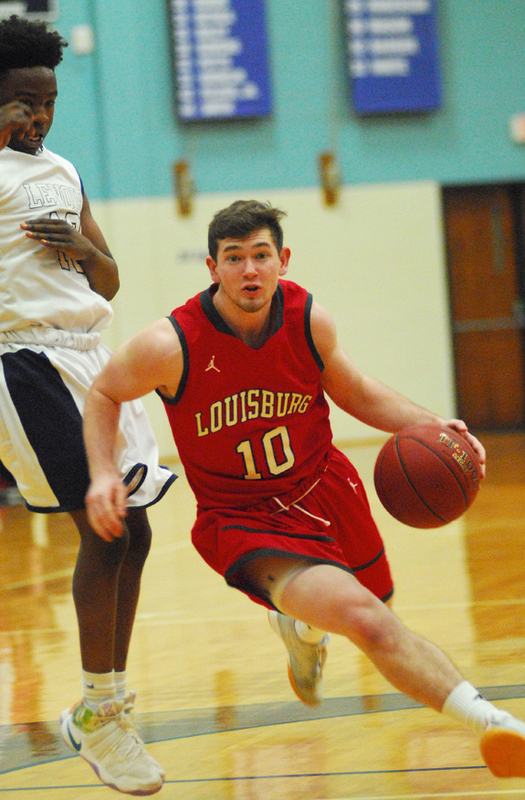 Louisburg College's Garret McCarty (with ball) drives into the lane during last Thursday night's road basketball conquest against rival Lenoir Community College. 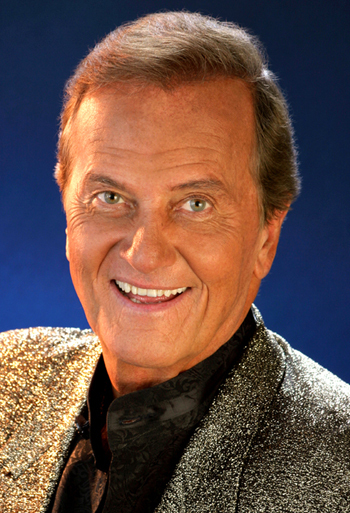 Pat Boone will bring his "Music and Memories" show to the JPAC on the Louisburg College campus for one performance at 2:30 p.m. Sunday. Feb. 12. In this funny and often touching autobiographical one-man show, the entertainment icon will sing the hits and tell the stories of his 50-plus years in show business. From the early days of competing with Elvis for the No. 1 spot on the pop music charts, to his film and television career, to an inside glimpse of his family life, Boone will show why he's still one of the all-time greats. Remember reading Shapespeare in high school -- and dreading every moment of it? Well, Wally Hurst, director of the Norris Theatre at Louisburg College wants to give you a different take on one of Shakespeare's classics, A Midsummer Night's Dream. Hurst is offering a short presentation and preview beginning at 2 p.m Saturday, Jan. 28, at the Franklin County Library annex, 106 Justice Street, Louisburg. A remarkable two-page spread in the April 5, 1896, edition of the Raleigh News and Observer describes the rise and current status of Louisburg's tobacco market. Filled with drawings of prominent businessmen and their businesses, the exposé demonstrates how tobacco had stimulated significant growth in "Franklin's charming capital." Articles by Louisburg attorney Charles Mather Cooke, who had recently been appointed by Gov. Elias Carr as North Carolina Secretary of State, and James A. Thomas, publisher of The Franklin Times, provide a clear picture of the town's recent development and prospects. Earlier this month and just after returning from winter break, teachers from Bunn High School and Edward Best Elementary School combined their efforts to host the inaugural Big Little STEM Day. As part of the day's program, 11 students from Danielle Dietz's Exceptional Children class hosted five activity and challenge stations for Claire Roehl's second grade and Katelyn Dwyer's fifth-grade students at Edward Best Elementary. The trio developed the idea for the STEM day via Twitter, says Dietz, thanks to monthly education chats facilitated by Franklin County Schools' Director of Professional Learning, Freda Clifton. LOUISBURG -- A Franklinton man began serving at least a 28-year prison sentence for his role in the murder of a woman and her daughter. Joey Kearney, who was 16 at the time of the Dec. 31, 2013 double homicide, pled guilty to two counts of second degree murder in Franklin County Superior Court on Jan. 18. He was sentenced to between 168 months and 214 months on each charge, to be served consecutively -- meaning after he serves the first term, he'll then serve the second. On Jan. 14, 2017, Mirenia Massenburg Strickland celebrated her 100th birthday surrounded by more than 100 family members and friends. 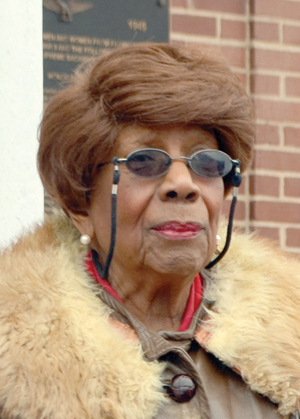 She was born on Jan. 14, 1917 and is the sixth child of 14 children born to Zollie and Martha Massenburg. 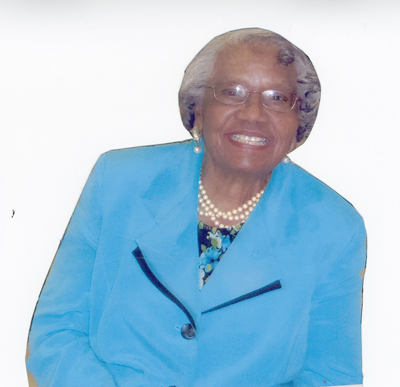 She was born in Franklin County and has been a cherished resident of the Mapleville community all of her life. She was married for 72 years to the late Joseph L. Strickland, former magistrate serving in Franklin County.